1997 The HSE and LSE conclude a contract on creating ICEF as an autonomous division of the HSE. The ICEF Board of Trustees is formed; it includes Sberbank, Vneshtorgbank, Vnesheconombank, Eurofinance bank, The Moscow Interbank Stock Exchange, and later Gazprombank and United Energy Systems. The first cohort of 38 students are admitted to ICEF’s double degree programme. 1998 The first group of students enroll at the University of London in Banking and Finance, the first specialization offered by ICEF. The Know How Fund grants ICEF a two year supporting grant. 1999 ICEF’s second specialization - Economics and Management - is opened within the framework of the University of London programme. 2001 The first graduation ceremony for ICEF students is held, and 13 graduates receive two diplomas, from the HSE and the University of London. Of these, 3 achieve Upper Second-class honours. The second contract with the LSE is signed. 2002 For the first time, 6 graduates receive diplomas from the University of London with First-class honours. ICEF graduate Alexey Khreshkov receives the Gerstenberg prize, which is awarded to the best graduates of all the programs of the University of London. ICEF graduate Svetlana Kovalskaya is admitted to a PhD program at the London Business School on a full scholarship. A National Training Foundation grant is received on a competitive basis within the framework of the Innovational Educational Development Project, implemented by the International Bank for Reconstruction and Development (IBRD). The research programme is opened at ICEF. 2003 The third specialization in Economics (which is actually the basic one offered at the LSE) opens. 2004 Another ICEF graduate receives the Gerstenberg prize – this time, Rinat Kirdan. For the first time, a group of graduates receive scholarships from Russian business and foreign universities (the Oxford Fund, Chievning, Michael Peacock, and the Basic Element). They are enrolled in master's programs of leading foreign universities including Oxford and the LSE. ICEF starts to recruit full-time teachers who are PhD graduates from leading foreign universities with internationally recognized qualifications. 2005 ICEF graduates and students achieve their best academic results. For the first time, more than 60% finish the program with good or excellent grades. Of the 43 graduates, 7 receive the degree with First-class honours, and 13 receive Upper Second-class honours. Out of 19 awards for academic achievements for studying across the world in the International Programme of the University of London and the LSE, 6 are awarded to ICEF students; 11 out of 37 Letters of Commendation are awarded to students at the College. The ICEF Board of Trustees approves a plan for the development of ICEF over the next four years, including the creation of a Master’s programme in partnership with the LSE. The third contract with the LSE is signed. 2006 ICEF graduates reach new heights: of 54 graduates, 13 receive First-class honours degrees. This is about one third of all First class diplomas awarded worldwide each year. The fourth specialization in the Bachelor's programme in Economics and Finance is opened. The HSE Academic Council approves the concept of a two-year Masters programme in Financial Economics, which will be implemented together with the LSE. 2007 ICEF celebrates its 10th Anniversary. The Master's programme in Financial Economics is opened. ICEF moves to new premises at the HSE campus on Pokrovsky Boulevard. 2008 The Director of the LSE visits ICEF for the first time. For the first time at the HSE ICEF graduates are awarded the European Diploma Supplement. ICEF graduate Vladimir Mukharlyamov receives the External Programme Award from the University of London - he is named the best graduate out of the whole University of London External Programme in the world. 2009 The first graduates of the ICEF Master's programme in Financial Economics receive a diploma from the HSE and an official letter of validation from the LSE. 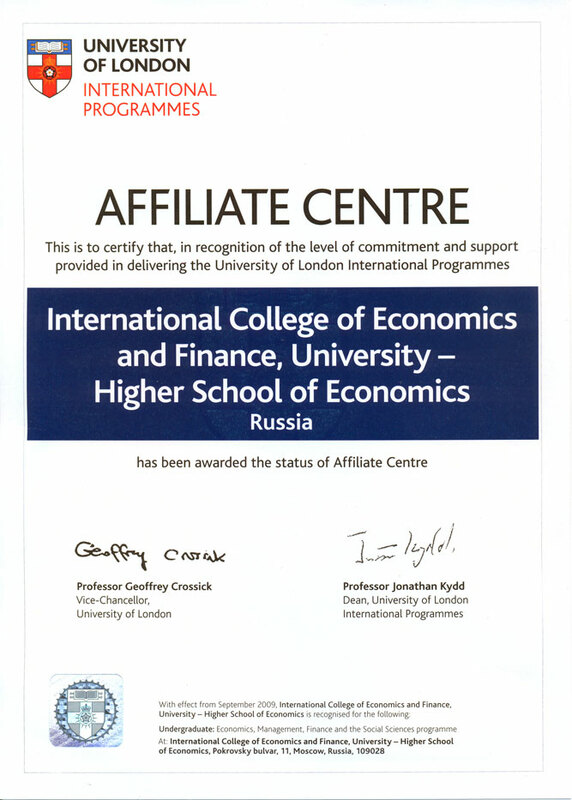 ICEF becomes an Affiliate Centre of the University of London International Programmes. 2010 The International Research Laboratory in Financial Economics is opened at ICEF. The tenth graduation ceremony for ICEF BSc students is held. The HSE approves the ICEF Development programme up to 2013 and for a long term. 2011 The First International Moscow Finance Conference, organized by the International Laboratory in Financial Economics (LFE) and ICEF is held. 2012 ICEF celebrates its 15th anniversary. On this occasion the LSE Director Craig Calhoun arrives in Moscow for a two-day visit to ICEF. He attends the ICEF Graduation Ceremony and Alumni Reception, meets with staff and students and gives a public lecture. ICEF hosts the Second International Moscow Finance Conference. New achievements of ICEF students: 15 ICEF students receive top marks on the University of London International Programme exams, while 17 students are awarded special Prizes and Letters of Commendation for outstanding academic achievement in the University of London International Programmes. State, government and departmental awards are presented to the ICEF academic and administrative staff for contributions to the development of research and education. 2013 The LSE and the HSE sign the fifth contract on ICEF development for the next four-year period. ICEF hosts the Third International Moscow Finance Conference. A new specialization in Mathematics and Economics is opened at ICEF within the framework of the UoL International Programmes. ICEF introduces state-funded study places on the Master's programme. 2014 The Chancellor of the University of London the Princess Royal Anne visits ICEF. During her visit, the Princess Royal meets with senior management at HSE and ICEF, as well as with ICEF students, faculty, and alumni. The University of London carried out a series of events as part of the annual monitoring of ICEF as a UoL Affiliate Centre. Upon completion ICEF receives a letter of commendation from the UoL noting ICEF students’ excellent results in international examinations, as well as the exceptionally high standard of the entire programme. 2015 ICEF director S. M. Yakovlev is awarded with a UoL honorary Degree of Doctor of Science (Economics), honoris causa, for his contribution to the development of higher economic education and ICEF's academic achievements. 2016 By results of 4th year exams 32% of graduates received 1st class-honours degrees of the University of London, which is the best result in history. As a rule, only 4-5% of the best graduates receive such degrees in the rest of the world. 2017 ICEF celebrates its 20th Anniversary.